Jamaica National Service Corps (JNSC) Intake 1801 conducting community service as part of the JNSC Outreach Project. For months, sections of west Kingston and south St Andrew were under lockdown by the Jamaica Defence Force (JDF), armed with powerful rifles as they set about driving out criminals who have terrorised residents for years. But last Saturday, the army took on another mission in the same zone but zeroed in on the Denham Town and Boys’ Town primary schools, trading in M16s for brooms, shovels, and power washers. 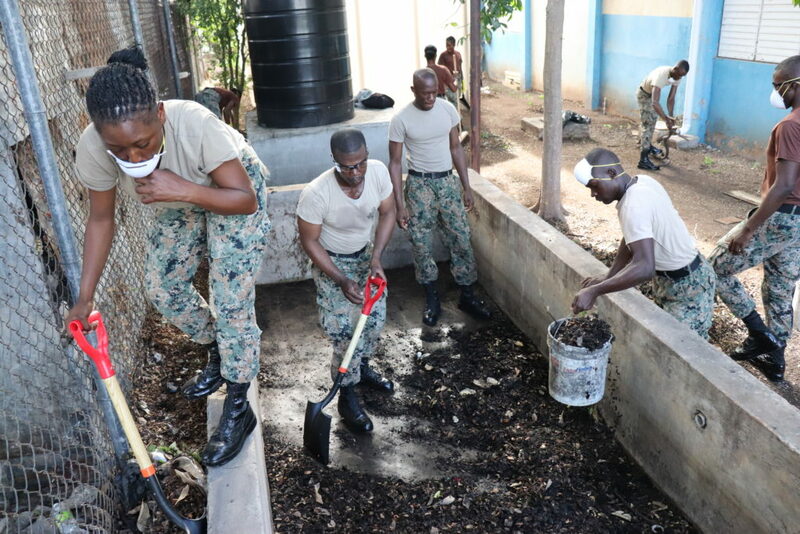 For hours, the team comprising members of Intake 1801 of the Jamaica National Service Corps was busy giving a facelift to the two inner-city schools. JDF Major Kaniel Smith, who was on the ground supervising the working group, said that the programme is geared at impacting youth by making them employable while providing them with life skills and instilling discipline. “The Jamaica National Service Corps is part of the National Military Engagement Programme, so the entire programme engages different aspects of youth, but this part engages any youngster who meets the criteria for enlistment in the JDF,” Smith told The Gleaner. Chadwick Gordon, one of the trainees, said he had recently completed one year in the programme, dubbing his experience “rough” but rewarding.